Not content to rewrite the rulebook on RGB lighting with their new Capellix tech at this year’s CES, rainbow gaming specialists Corsair also announced a new wireless technology today that will form the foundation of all of their wireless gaming peripherals going forward. Dubbed Slipstream, it’s twice as fast as their previous generation of wireless tech, has a massive range of up to 65ft, supports three devices on a single adapter, and will constantly search for the best frequency to keep your connection nice and stable. And best of all, it will make its first appearance on one of Corsair’s cheapest gaming mice, the Harpoon RGB Wireless. Priced at $50 (UK pricing to be confirmed) and weighing a mere 99g with up to a stonking 60 hours of battery life, the Harpoon RGB Wireless will be the first mouse to take advantage of Corsair’s new Slipstream technology. You’ll still be able to use it wired or over Bluetooth if your device doesn’t have a port for its wireless dongle if you prefer, but Corsair’s Slipstream tech does sound rather promising for any one who’s always yearned of freeing themselves from the rat warren of cables living behind their desk but have found previous wireless peripherals to either be too slow, unreliable, or both. Here’s how it works. The key thing behind Corsair’s Slipstream tech is its Intelligent Frequency Shift feature, or IFS for short. This constantly scans the wireless spectrum at a ludicrously fast rate (0.5 milliseconds, according to Corsair) in order to find the best and most stable transmission frequency, even when you’ve got multiple wireless devices going in your home at once. That’s even faster than Logitech’s 1ms Lightspeed tech, which I’m very much a fan of after testing their excellent and best gaming mouse champion Logitech G Pro Wireless mouse. The Harpoon RGB Wireless will be Corsair’s first gaming mouse to use their new Slipstream technology. Indeed, Corsair claim that Slipstream creates a signal strength that’s around 2.5x stronger than their previous generation wireless tech, which will hopefully come as good news for those who have struggled to use 2.4GHz devices in the past. Add in its ability to deliver double the number of data packets per millisecond of bandwidth (again, compared to Corsair’s last gen wireless bits and bobs), and Slipstream makes quite the compelling argument to ditch the rat warren of cables behind your desk and go wire free. Corsair doesn’t want you to stop at just using wireless mice either, as a single Slipstream adaptor can also support up to two more devices such as your keyboard and headset, too. It’s still too early to say what form those particular Slipstream devices will take at the moment, but I’m particularly looking forward to seeing what kind of headset they come up with, as the microphones on these things never tend to be very good due to the fact that their own wireless chipsets often interfere with the quality of said microphones. Slipstream should fix that, according to Corsair, but we’ll have to wait and see how it all performs once they announce some actual products. 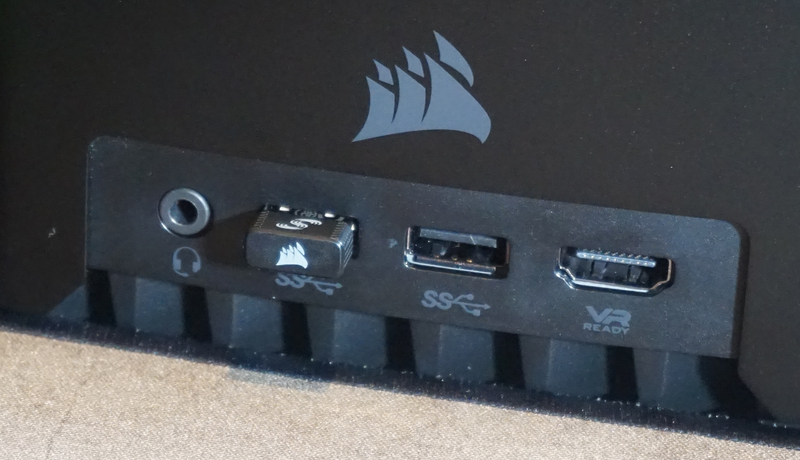 Corsair’s Slipstream adaptor can support up to three different wireless devices at once. 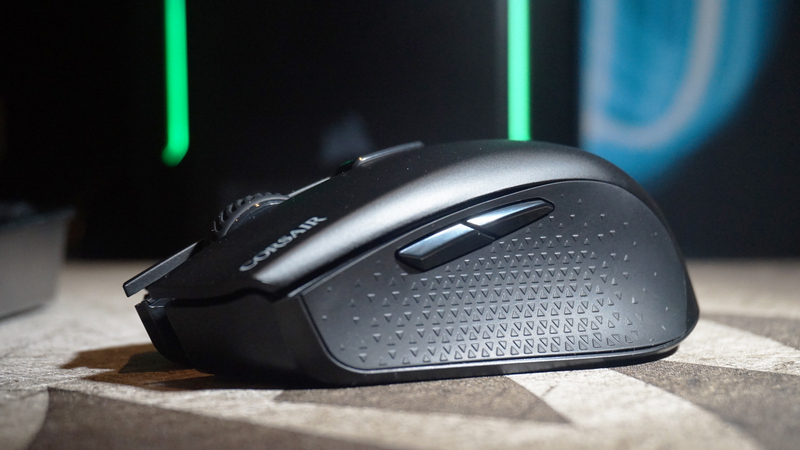 Just in case you really can’t be persuaded to part with your mouse cables yet, Corsair also announced two new gaming mice alongside the Harpoon RGB Wireless today, the M65 RGB Elite and the Ironclaw RGB. Costing $60 apiece (UK pricing to be confirmed), both have brand-new Pixart PMW-3391 sensors with speeds up to an inhumanly fast 18,000 DPI. Palm grippers will probably prefer the 105g Ironclaw due to its larger, contoured design, but those after something a bit more flexible will likely get on better with the M65. Not only does it have redesigned cluster of side buttons and a dedicated ‘sniper’ button for on-the-fly DPI changes, but its base weight of a mere 97g can be bulked up to 115g by adding extra weights to the main body.